Our newest Licensing Partner is The Surface to Air System, co-founded by High School Football Coach Rich Hargitt. 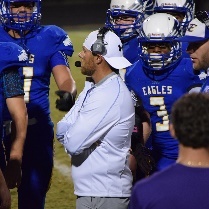 Coach Hargitt is an accomplished writer and sought after clinic speaker on the Air Raid Offense and RPO based Offenses, particularly for the High School level. He has developed an approach to apply Spread and RPO concepts in a way that enables a High School Quarterback to take advantage of defenses using Matchup, Leverage, Open Grass, Box Number and other advantages. Our licensing arrangement with The Surface to Air System enables our members to view a number of videos from the 2018 and 2019 National RPO Clinics, many of which feature Coach Hargitt presenting these and other concepts. Additional clinic videos cover Offense and Defensive topics that focus on the Run / Pass Option . Option Central Members and Guests can learn more by visiting the Surface to Air System web site. Our Contributor and Licensing programs enable us to bring material to our Option Central for our Members and Visitors, and is designed to be a win-win proposition. Our Contributor information pages like this one were introduced in late 2012 with a dual purpose: To help our members and guests learn more about our Contributors and to provide contact information for them, including a web site link when applicable. Interested in learning more ? Contact Us with your questions about the Contributor or LIcensing Partner programs.